Plus, you'll find brief details concerning the Federal City 1791 horoscope in a 2015 Obama-era SO'W post if you care for a peek. 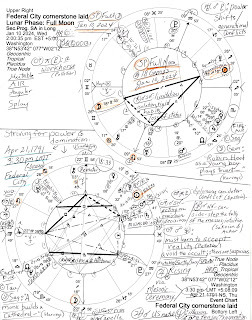 Of course I had no 'Trump' in mind in early 2015 when I typed the post, yet Trump's natal 10th house Sun-NN-Uranus trio perches saucily atop the Midheaven of the 1791 chart (MC 22Gem58) along with US natal Mars just as 1791 Jupiter in Virgo rises (3:30 pm selected by the Masons because Jupiter in Virgo was rising) along with America's natal Neptune. 1791 Jupiter conjunct US natal Neptune (1776) in our era suggests pretense and illusion as the Federal City was founded--or, inspiration and the grand spirit. Yet the Founding Fathers of 1776 and 1791 were apparently unaware of the existence of far away planet Neptune with its potentials in Astrology for delusion, deception, fraud, dissolution, and its basic urge to merge. Now naturally, your eagle eye spies a YOD pattern, too, between the 1791 Mars-Pluto sextile pointing to the rising Jupiter and Ascendant (and US natal Neptune) although Neptune and Pluto were unknown in 1791. YODs suggest turning points, crossroads, special tasks, or crises for Washington DC in relation to ideals, finances, promotion of ideas (spreading democracy? propaganda, media), expansion, growth, and/or exploration. 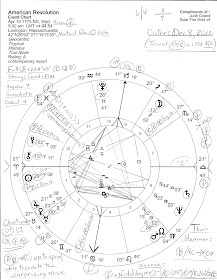 Plus, this is a Jupiter-square-US-Mars transit denoting a period when moderation is needed, too much force may be used, rash actions can create more problems, and overestimation of strength or ability often occurs. In addition, a heady whiff of America's Jupiterian 'Manifest Destiny' may be noticed. 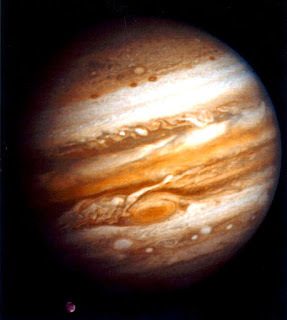 So each time since 1791 that transit Jupiter has returned to its 1791 degree, the Federal City's Mars-Pluto YOD has been re-activated, plus, other transiting planets and progressions have had their effects as well. The last/current Jupiter Return to 22Vir38 is a three-fer due to retrogradation; the exact conjunctions perfected on December 19, 2015, January 27, 2016, and August 3, 2016--reminding us of Donald Trump riding his escalator down from on-high (June 2015), paying an audience of actors to applaud his prez bid, campaigning ad nauseum (ongoing), and on November 8, 2016 being selected by the Electoral College to play the POTUS role against all common sense. For those of us attempting to ignore the recent and ongoing chaos he thrives upon and his dismantling of our traditions and institutions which he has apparently been plopped in the Oval Office in order to perpetrate, Wikipedia keeps a handy list of the Events of 2016 for our reviewing pleasure; of course, 2015 events are available there as well. 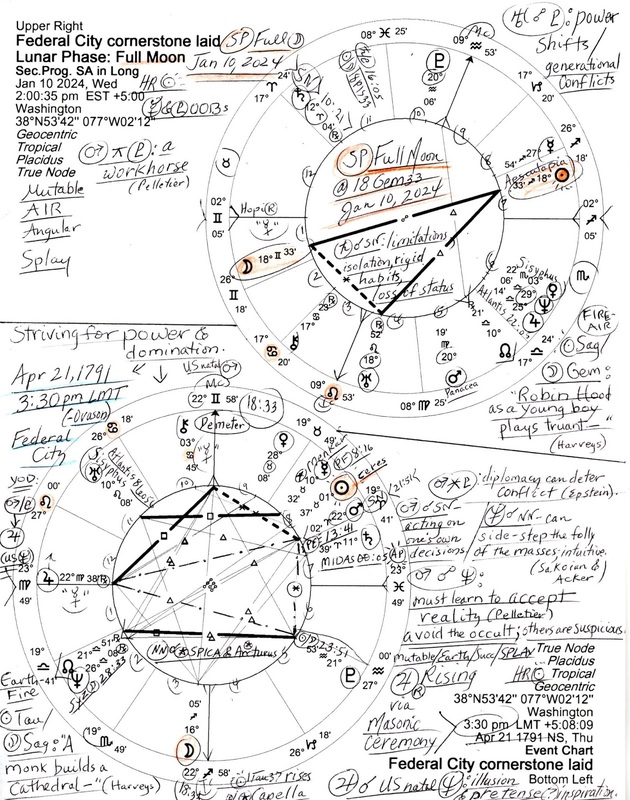 Eclipse watchers might wish to consider the solar eclipse themes of 2024 of which there are two: April 8th @19Aries in the 8 North Saros Series (prophetic visions, dreams, hunches), and October 2nd @10Libra (conjunct the 2024 SP Full Moon's North Node!) in the 8 South series (separation and loss; physical injury is possible; over-straining of one's strength--Brady). And if we read the planets of the Federal City's YOD as midpoint pictures, we have potentials for: Mars-Pluto = Jupiter: the big plan comes into focus (Utopian America, aka, the New Atlantis! ); making things happen (a capital city); Mars-Pluto = ASC: showing the hero image; the fighter who dares the impossible; and Mars-Pluto = US natal Neptune: cunning strategies; subterfuge; plotting rebellion (Solar Arcs, Noel Tyl). These potentials all sound like my former Federal City of residence to me. 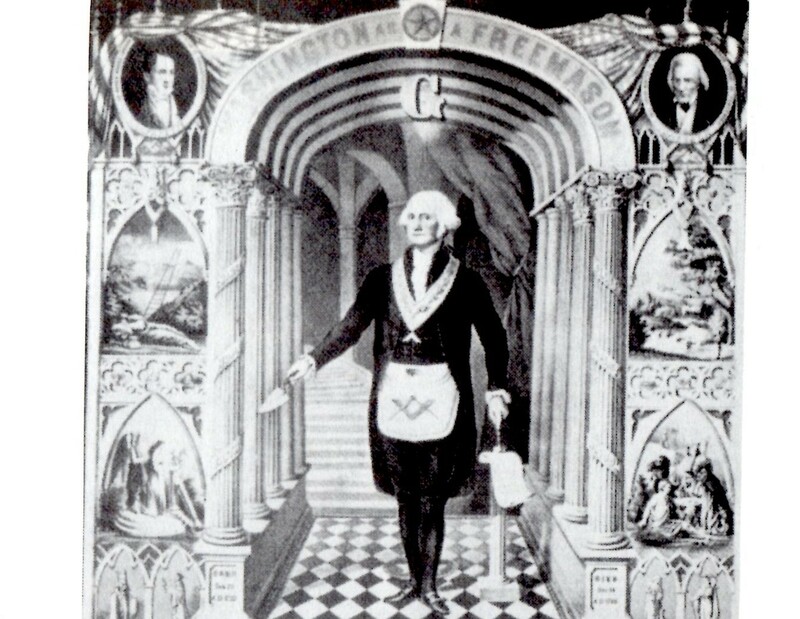 Now here's a very much related previous post concerning associated topics: In Tribute to Master Mason George Washington.